One of Australia’s best known plants Sturt’s Desert Pea or Swainsona formosa is attractive but a difficult plant to grow in cultivation. It is the floral emblem of South Australia and named after the explorer. Found naturally growing in the arid inland areas of South Australia and other areas of central Australia the plant is a real survivor. It copes with extreme heat, frosts and drought. The survival mechanism is the long tap root which reaches deep into cooler moisture holding soil. This tap root also makes the plant very difficult to transplant. After a good wet season Sturts Desert Pea can cover large areas with it brilliant flowers putting on a spectacular show. 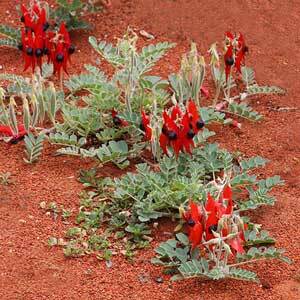 Take into account the natural habitat of Sturt’s Desert Pea, hot sandy soil and the ability to send down a long tap root. These conditions are a little difficult to mimic in most gardens. Excellent drainage is essential and full sun with good air circulation is also required. Sturts desert pea is not naturally an ‘easy care’ plant in the garden. Usually best as a potted specimen where conditions can be controlled, an open sandy potting mix and good drainage. We would suggest that it is worth looking for the Grafted Sturt’s Desert Peas are the most hardy for east coast conditions. In good hot dry conditions flowers are very long lasting, 6 – 10 weeks, in cooler periods or after rain flowers will be shorter lived. 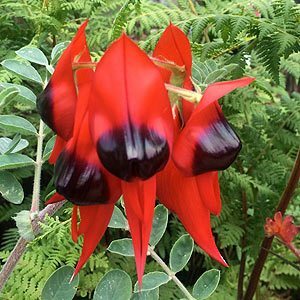 Try growing Sturt’s Desert Pea in a pot, a sunny position beneath the eaves of a house is good, this will protect the foliage from moisture. Swainsona formosa or ‘Sturt’s Desert Pea’ (picture above) with its flame red flowers has made this species widely recognised. It is wide spread, all states excepting Tasmania and Victoria. However other species exit, Swainsona galegifolia is the ‘Darling Pea’ a long-lived shrubby perennial with nice white, purple, pink or red flowers and is found in both NSW and QLD. Swainsona sejuncta is found in QLD only and is not widely distributed. Swainsona acuticarinata, Swainsona beasleyana, Swainsona calcicola, Swainsona decurrens and Swainsona cyclocarpa are a few of the many other species By far the most common in nurseries are Swainsona formosa or ‘Sturt’s Desert Pea’ and Swainsona galegifolia.